Avocado vinaigrette served in some of the fine restaurants of Mombasa have a bit of anchovies in it. Most restaurant owners do not understand that when you are a vegetarian it includes no fish! Most say but fish is vegetarian. Did he mean the fish was a vegetarian? If you are lucky to get vegetarian avocado vinaigrette as a starter, then you just eat it quietly savouring the acetic acid because you will be paying for the dish at the end of the meal. Obviously, I have stopped ordering avocado vinaigrette at the restaurants and instead make my own at home whenever avocados are in full season. Vinaigrette is simply a mixture of oil and vinegar, sometimes seasoned with spices, herbs and other ingredients like anchovies, fruit, garlic, shallots etc. The norm is 3 parts of a good neutral or flavoured oil to 1 part of a good quality vinegar and not acetic acid which is very commonly sold in the supermarkets here. If you can’t buy a good quality vinegar then just use fresh lemon juice. Vinaigrette actually translates into a french dressing and can be used for most salads. Chop the tomato and onion finely. Mix together in a bowl. Add to it the herbs and pepper. Whisk lemon juice, oil and salt very well. Add this to the tomato onion mixture. Mix well. Cut the avocado into half. Remove the seed. Spoon the mixture into each half of the avocado and serve. If you need to serve this dish as a starter to guests, you can keep the tomato mixture ready in advance in the fridge but do not add the salt. Add salt just before serving. 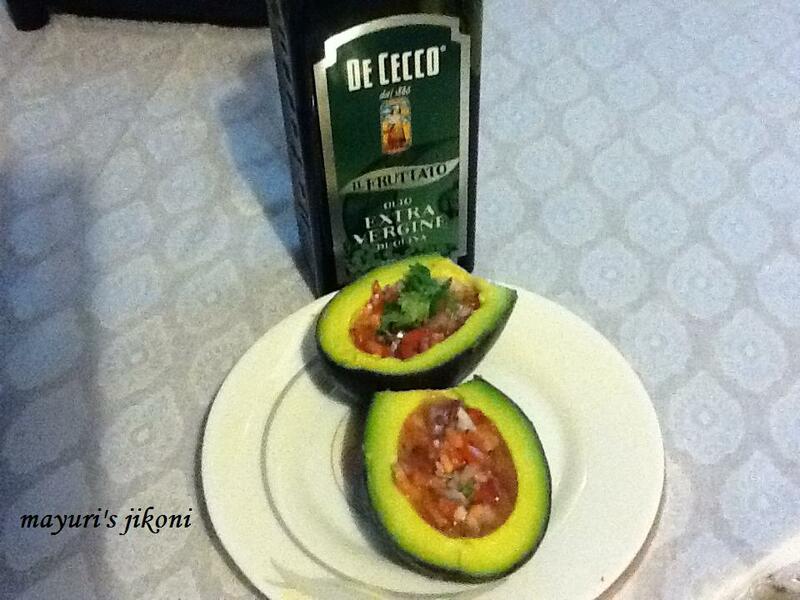 If you are working with more avocados, then brush each half with lemon juice to prevent it from turning black. Instead of onion or shallot can use spring onions, chopped finely. Can add a tsp of finely chopped walnuts or pine nuts for an extra special treat. Remember to toast them slightly in a pan. For chilli lovers, add finely chopped green chillis at your risk. As a tummy filler for ekadashi day, omit the onions. Can add chopped olives. Oh mummy! This looks so yummy!